A few weeks ago, we took a last minute flight out to Hong Kong to visit my Gran who had taken seriously ill. We were in Hong Kong for two weeks staying in a hotel with little opportunity to cook a home cooked meal. For two weeks, my son enjoyed the culinary delights that Hong Kong has to offer, watercress didn’t feature heavily on the menu or in his diet during the two weeks. During our trip his eczema got worse, this could be a coincidence with dehydration, more processed food and the lack of watercress in his diet. However, it could be attributed to the hot and humid weather he was experiencing, as well as exposure to carpet in our hotel room. Floor covering may seem a strange thing to highlight but the type of carpet or bedding used by an eczema sufferer can have severe effects as can other household items. Floor covering - All-cotton carpets or plain hardwood floors are better than man-made fibre rugs. It’s especially true if you've got a baby who's crawling. Natural fibres are also a good choice for curtains and furniture upholstery. Fragrance free detergents - Detergents and household cleaners with a heavy scent can irritate eczema. Vegetable oil-based cleaning products are recommended because they're especially gentle on sensitive skin. Don’t forget about dust - Many kids with eczema are allergic to dust mites. To keep them away, vacuum and dust around your house at least once a week. Also, wash stuffed animals. They can be comfy homes to lots of mites. Bedding - Most bedding can attract dust mites. You can buy a dust mite protective cover for your child's mattress. Although it won't prevent eczema, it may help with asthma and other allergies. Clothing - Stick with natural, breathable fibres, like cotton. That’ll give them a layer of protection but won’t make them itch. Avoid man-made materials and itchy natural fabrics such as wool. Cotton is also best for pyjamas. Add a pair of cotton gloves if your child scratches while sleeping. The next night we visited my parents for dinner and bought some fresh watercress at the market which my mum stir fried with spring onions. It could be a coincidence; however, my son’s itchiness and eczema calmed down for the remainder of our trip. Once home, I restarted my son’s watercress intake with gusto to undo the setback we had where new broken skin existed. Today we were very jet lagged, and I couldn’t face cooking at home, so we had lunch in a Chinese restaurant, unfortunately there was no watercress on the menu. However, dinner was leftover yung chow fried rice from our lunch, which I added finely chopped watercress to. It was a hit! For lunch today I attempted to make frittata (try a recipe here). I whisked two eggs with chopped watercress, spring onions plus a dash of mushroom soy sauce. It went down like a lead balloon; my son couldn’t stomach more than two bites. Despite his rejection, I praised him for trying the second bite after the face he pulled eating the first bite before he declared he had enough. That evening, I knew dinner was going to be a battle, my son was extremely jet lagged and cranky with no appetite. I had to wake him up from his afternoon nap which he took to be his main sleep and was not pleased. To engage him with his dinner, we put steamed fish chunks and watercress into a tortilla wrap while the husband and I had it with udon noodles. It was a hit and he even ate some of our udon noodles. For lunch, we needed a packed lunch, as we had a day out planned. So, I made a wrap and put marinated garlic (it comes in a jar from Lidl - peeled garlic cloves, marinated in olive oil and Italian herbs and spices, usually found in farm shops), black olives, watercress and turkey slices in it. My son loved it and was delighted with the added bite and flavours the marinated garlic and olives provided. 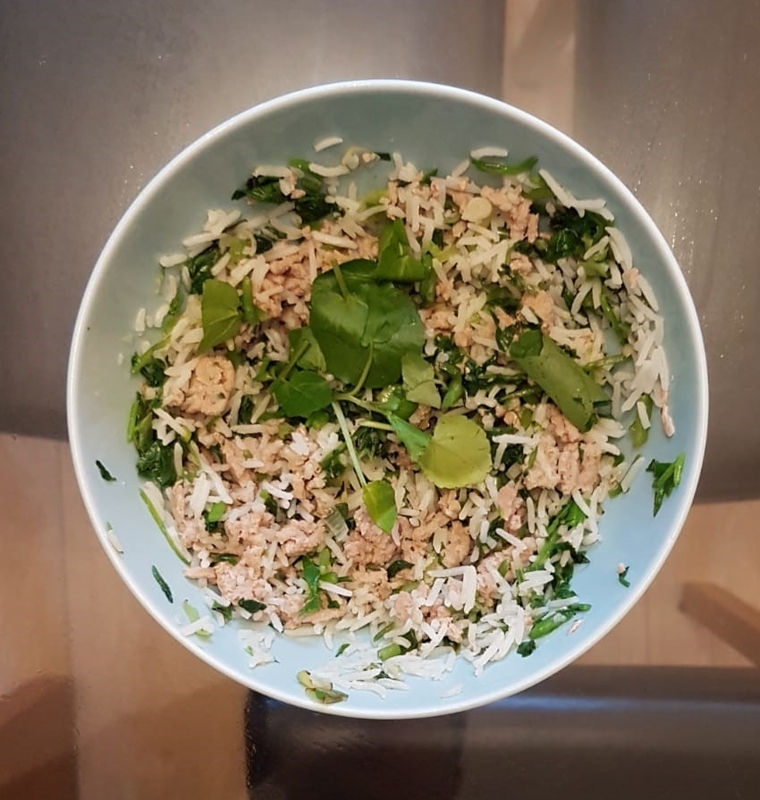 For dinner, we had boiled rice with steamed turkey mince and chopped watercress mixed through it. Still jet lagged and sleepy, my son was unimpressed - in his defence it was rather dry. It needed sauce to bind them. Our jet lag is starting to subside a little, so I had the energy to cook some proper home cooked meals again. For dinner, we had pork chops marinated in garlic and a splash of soy sauce. The pork chops were pan fried then cut into strips, before being stir fried with watercress, spring onion and oyster sauce. The stir fry was served with boiled rice. It was a hit! My son seems to like the strong flavours of soy, oyster sauce and garlic, just like his daddy! After our first week back home, the new broken skin on my son’s ankles is beginning to heal and subside. I am hoping for a better week next week with less sleepiness and cranky dinners. See here for some more delicious inspiration featuring watercress, with recipes developed by The Watercress Company’s development chef, Keri Astill-Frew.